I love a maxi dress with an uneven hemline. They look great when you move and see a flash of leg. 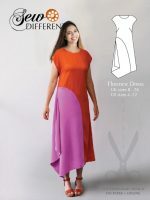 This Handkerchief Hem Maxi – FREE SEWING PATTERN is an loose fitting throw-on-over-a-swimsuit type of dress. I imagined it first in a grey marl jersey with an orange trim (and I may yet make it in these fabrics) but I got distracted by this black and white print and ended up going with the hot pink trim instead. 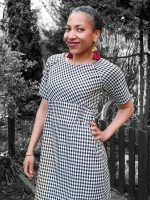 This dress is really easy to make but it does take quite a lot of fabric – between 2.5 – 3 metres. I think for this pretty swishy dress I would use a satin finish bias binding to keep the elegant swishy feel. I haven’t done a full tutorial but here are the basic step-by-step instructions. If you are not familiar with sewing opposing curves – have a quick look at this tutorial first. Or this one. It isn’t difficult but could be very confusing when faced with non matching pieces of fabric if you are not expecting it! Line up the blue dots on the FRONT BODICE and one of the SLEEVES with right sides together. 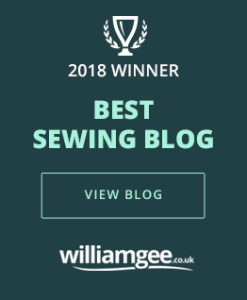 Sew down to the green dot – the shapes do not match – you will have to gently ease the fabric round to make the cut edges align with each other. Do the same with the other sleeve and the other side of the FRONT BODICE. 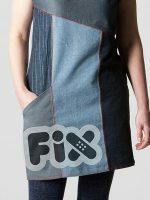 With right sides together, sew the FRONT SKIRT to the FRONT BODICE. (Again you will have to ease the curve of the skirt along the straight line of the BODICE). Repeat for the BACK SKIRT onto the BACK BODICE. With right sides together sew up the sides of the skirt. 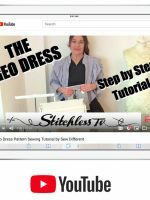 5 Finish the skirt hem with a contrasting bias binding so that it shows on the outside – see how to do it here. 6 Finish the neckline and armholes with hidden bias binding. This is lovely! I think just the top would make a great shirt, as well. Love the pop of pink at the hemline, Laura. Roughly how much fabric would this use? I have. Single duvet cover which I want to reuse and wonder if this will be enough? Love the pattern by the way! I love you’re ‘adventures in sewing’ the fabric choice is great. 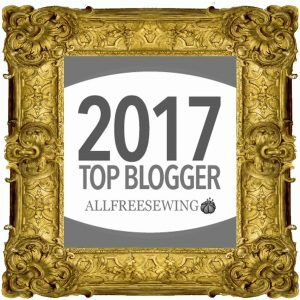 Are the pattern inclusief seam allowance? In Holland never. Hi, there is no seam allowance on my patterns. 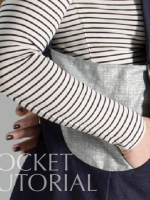 I tried to leave a comment on the relevant page (http://www.sewdifferent.co.uk/hi-low-pocket-top-new-free-sewing-pattern/) but there is no comments facility. Thanks for the pattern but am I being dim or are there no sleeves in the pdf? Great work this blog and really appreciate the free downloads. I’m all set to make this dress and I don’t see any blue measurements anywhere. I see the box that says if I’m drawing out the pattern myself to follow the blue measurements but where are the “blue measurements”? I’ve been sewing for years and feel comfortable with drawing my own pattern (also, yours wouldn’t fit me) but I need something for comparison. Thank you! Aaah, I’m afraid only some of the patterns have measurements on them. I gave up doing it becasue so few people seemed to use them. I’m sorry I can’t provide them for this dress. I love the pattern but can’t get it to print. Hi Donna, what is the problem exactly? Is it opening in acrobat or in your web browser? I am going to attempt to make this. will post results. Thanks for offering this dress. I loved the dress, but not a fan of bust darts. So my take on this dress is to use a simple t-shirt top and a matching or complimentary color for the bottom of the dress.